After the somewhat lackluster Zee Cine Awards, we, at India-Forums, were not expecting much better at the Filmfare Awards 2019, but we were taken by surprise! The Filmfare Awards held on March 23rd, 2019, was star-studded and glamorous. Many celebs brought their A-game and left us begging for more! In fact, we are so impressed by the turnout that we are dedicating a best dressed specifically to each gender separately! Kriti Sanon set the red carpet glittering with this full-length Zara Umrigar gown with a side split. The plunging neckline added much oomph to an already gorgeous gown. Sanon paired the dress with matching earrings and a pair of strappy gold metallic sandals. We love that her stylist, Sukriti Grover, chose to keep her outfit accessory-free, only adding a silver ring. The gold sandals and silver ring added a pop of color to what would have been a one-color ensemble. The open hair held back by two clips and purple eyeshadow was the perfect finish to a stellar look. Katrina Kaif didn't so much wow us, as just please us. While she played it safe with the open, wavy hair and standard makeup, we liked the gown and the styling by Tanya Ghavri. The Falguni and Shane Peacock powder blue gown paired with diamond earrings and rings accentuated her face and body structure. The long, hidden side split in the gown was a nice addition along with the long train. We do wish, though, that Kaif would take some risks on the red carpet and come out of her comfort zone. We are getting tired of seeing the same styling. Nonetheless, a safe zone properly done. Another actress known to play it safe, Deepika Padukone showed up at the Filmfare Awards wearing an Alberta Ferretti black gown from their 2019 limited edition couture collection. The tuxedo jacket style top contrasted with the multi-layer tulle skirt well and Padukone pulled it off nicely. Her stylist, Shaleena Nathani, also did a fantastic job by adding dangling diamond earrings, a couple of rings (we're betting the one that was shining the brightest was her wedding ring), a tousled updo, and dark eye make-up. We do feel that Padukone looked quite tired, possibly from the continuous flying and shooting for her next film, Chhapaak. We hope she gets some rest and comes back looking like a million bucks! Next up we have debutante and already a style icon, Sara Ali Khan. Khan chose to also play it extremely safe, sticking to one of her favorite designers (well actually a designer duo), Abu Jani-Sandeep Khosla. The ivory-colored lehenga was a beautiful complement to the red carpet and the gowns, tuxedos, and suits. However, she chose to round the look up with minimalistic makeup, unstyled hair and rather simple watch, bracelet, earrings, and ring. We do wish that she had added a fine necklace and possibly done something more with the hair. In this look, it appeared as if Khan was attending a family gathering, not a red-carpet event. While she didn't totally win us over with her look, we do want to congratulate her for winning Best Debut (Female) for her stellar performance in Kedarnath (2018). Rounding off our list of best dressed females is Diana Penty. Penty attended the event wearing a gorgeous one-shouldered Dolly J gown. The ruffled pink dress with pink cheeks, red lips, and a tied back ponytail was just oh-so-gorgeous! Keeping the accessories to a minimum, Penty showed the world why she is a top model. The clear sandals are a brilliant addition to the outfit because not only do they appear to not be there, but when you do see them, they just add to an already stunning outfit. Kudos to her stylist Namita Alexander! 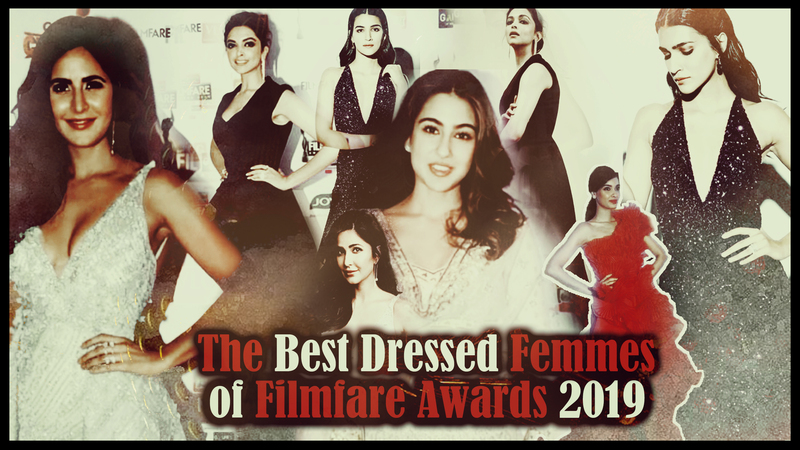 The Filmfare Awards is one of the biggest award events of India and every year, celebrities dazzle us with their fashion choices. Whether it be these five gorgeous femmes or others such as Urvashi Rautela, Dia Mirza, Kajol, and Hema Malini, the turnout was great and so was the elegance and grace. That being said, there were unexpected letdowns especially from a few fashionistas, but we have decided to talk only about the best dressed and that's why a thumbs-up to all these ladies. Despite many of them playing it safe, each of them wowed us and we can only appreciate them, their stylists, and the designers. The men were not any less dressed to impress as you can see in our other feature article, but more on them in that article. Here, let us know what you think? Which gorgeous actress impressed you the most? Do let us know in the comments below! Editors: Ritchelle C. and Gunia K.